Foundation is Rotary's own charity which all clubs support - their help to deserving causes spreads throughout the UK and world wide. Our club is able to apply for grants from Rotary Foundation for specific projects where we wish to help people in need - our Memory Cafe is a good example. Internationally the club financially supports Sister Eileen McCloughlin at the Chigwell Convent with her work abroad as well as annually hosting an overseas scholar in London. This year our scholar is Malika Bakayoko from The Ivory Coast who gained a degree in Industrial Engineering at the university in Carmaux,France. 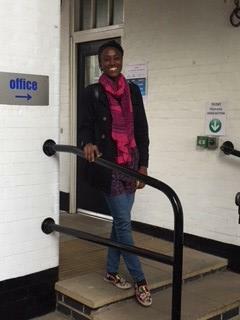 Malika is in London to do a Masters degree in International Business Management at Hult University and is being sponsored by the Rotary Club of Carmaux via a Foundation grant. .In the past three years it has been our pleasure to have hosted Caroline Noland from the USA , Hyungjin (' Tom') Kim from Korea and Caroline English from Australia, all of whom studied in London for 12 months. Leytonstone & Woodford Rotary Club is also honoured to be 'twinned' with The Rotary Club of Mainburg, near Munich with whom we exchange visits every 2 years.